Crazy Shenanigans: Theater Thursday on a Wednesday?!? That's right folks it's Theater Thursday....oh wait...no it's only Wednesday! Right now, I bet your asking yourself, "Why is she posting Theater Thursday when it's only Wednesday?" The Answer: Because I have interesting news to post about tomorrow and I'm not big on posting more than once a day. Soooooo...that leads us to: Theater Thursday! My favorite line from the movie has got to be when Ray (Akryod) says, "He's an ugly looking spud isn't he!" To Venkman (Murray) when talking about the green slimy ghost. If you haven't seen this movie then you are truly missing out on a piece of American cinema. This movie also has that summer vibe feel to it. Also I love the small part Annie Potts has in it. I loved her when she was on Designing Women (which happens to have season 1 on dvd). You are killing me with all this suspense! I love that movie! I think I even had a few Ghostbuster action figures. And then of course the is the giant stay puff marshmallow man! We watch this a lot at the USO. I love this movie! I watched these movies a lot when I was a kid and loved them! I love this movie! I used to be terrified of it as a child...even of the stay-puft marshmallow man! 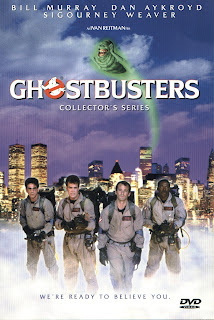 I had no idea that they were making another Ghostbusters...how funny!